We are excited to be spotlighting our new monthly showcase! We will be featuring a regular event for one of our member groups each month. We encourage those who have not attended to do so and meet some of the people from that organization. Generally these will be either social gatherings or discussion groups. “Ethical” is a welcoming home for humanists. They have provided non-theistic services in a congregational setting since 1876. Join them in celebrating life’s joys, supporting one another through life’s crises, and working together to make the world a better place. They offer lectures, films, discussion groups, music, and much, much more. Visit ethical.nyc. Caleb Smith (Domhnall Gleeson) wins a competition to spend a week at the private mountain estate of the company’s brilliant and reclusive CEO, Nathan Bateman (Oscar Isaac). 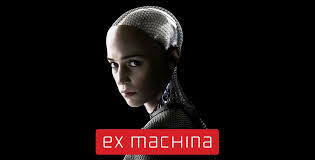 Upon his arrival, Caleb learns that Nathan has chosen him to be the human component in a Turing Test – charging him with evaluating thecapabilities of Ava (Alicia Vikander), his latest experiment in artificial intelligence. Post-film discussion led by Chris Everett.